This book covers the most important issues from classical and robust control, deterministic and stochastic control, system identification, and adaptive and iterative control strategies. 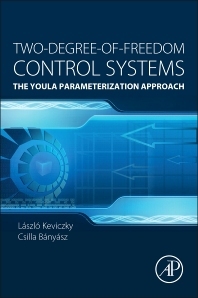 It covers most of the known control system methodologies using a new base, the Youla parameterization (YP). This concept is introduced and extended for TDOF control loops. The Keviczky-Banyasz parameterization (KP) method developed for closed loop systems is also presented. The book is valuable for those who want to see through the jungle of available methods by using a unified approach, and for those who want to prepare computer code with a given algorithm. Professor Keviczky has a PhD in design of regression experiments and a Doctor of Sciences Degree from the Hungarian Academy of Sciences (HAS). He was the founding member of the Hungarian Academy of Engineering and was appointed as a Foreign Member of the Royal Swedish Academy of Engineering Sciences. He was Director of the Computer and Automation Research Institute (CARI) from 1986-1993 and is still a Research Professor there and a Director at the Multidisciplinary Doctoral School at Széchenyi István University, Gyôr. He has worked with IFAC in various positions since 1981 and was Associate Editor of IFAC’s Journal Automatica for six years. He was also General Chair of ECC’2009 and the president of the European Union Control Association (EUCA) from 2010-2012. Keviczky was the founding member of the Steering Committee of the COSY European Science Foundation project and initiated the launch of the EU project DYCOMANS. He has written c-400 papers and has c-701 citations, placing him as the number one expert in this area in Hungary. Computer and Automation Research Institute, Hungarian Academy of Sciences, Hungary. Dr Banyask is currently a senior research scientist at CARI where she has worked since 1969. She has a Doctor of Technical university degree and a Candidate of Technical Sciences degree. During her career she has been awarded the Frigyes Csáki Medal, the István Kruspér Medal, the Outstanding institutional service award (3 times), CARI, and the Knights’s Cross of the Order of Merit of the Republic of Hungary. She has written c-180 papers and has 118 citations.